The PostBase Qi4 is a low to medium volume franking machine manufactured by FP. It can process at a speed of 45 letters per minute and it is recommended your business sends at least 200 pieces of mail per day in order to enjoy the full benefits of the Qi4. 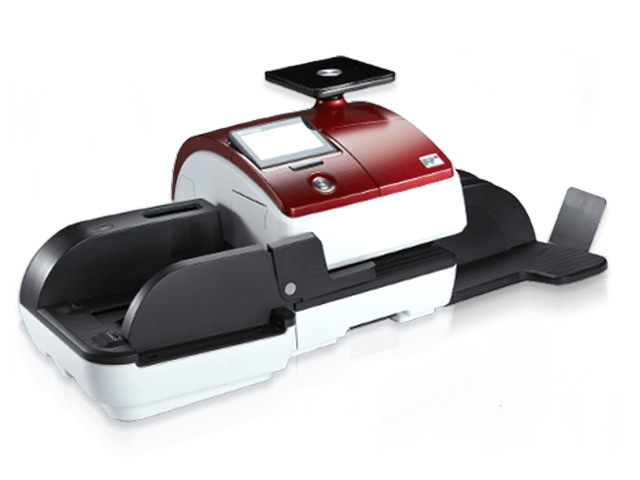 The Qi4 makes franking mail easy with it’s simple controls and conveniently accessible features, there’s also the option of having an automatic letter feeder and letter sealer to save even more time. The Qi4 comes with a label dispenser and integrated 3kg weighing scale as well as optional differential weighing, all features that ensure franking mail is as efficient and time effective as possible. The Qi4 also has Navigator Plus which is a remote control navigator and reporting system, it can print up to 10 advertising logos and gives you cost accounting for up to 10 departments. Everything on the Qi4 is there to make franking easier, quicker and more cost-effective. The Qi4 is the perfect franking machine for small to medium sized businesses, it has the ability to send 2700 letters per hour and is recommended for businesses who send more than 200 pieces of mail a day. A low volume franking machine is generally available for around £1000, this machine would likely cost more than that due to it’s abilities and features. FP do not publish their product prices online but you can request a quote from us and we will provide you with the pricing information of this product. You are able to buy, lease or rent franking machines depending on what best suits your company’s needs. To buy a machine will mean a large initial investment and ownership of the machine and to rent will mean smaller monthly charges with breakdown and maintenance services included as well as easier upgrades or downgrades if your postage requirements change. Speed: 45 letters per minute. The PostBase Qi4 is an up to date machine that has all of the latest features and capabilities, it is aesthetically pleasing and comes in 5 different colours so will look great in any office. This franking machine is also very quiet so it won’t be distracting or disruptive in even the smallest office environment. To use the Qi4 is very self explanatory, the touch screen control panel is simple to use even for franking machine novices and the system makes sure all of the features can be easily accessed and utilised. There are many optional extras you can include with the Qi4 which makes it suitable for a range of businesses who send between small and medium volumes of mail. The maximum envelope thickness is 10mm but the machine does come with a label dispenser for mail larger than that. You will save money and time when using this franking machine and you certainly won’t be left scratching your head or feeling frustrated with this user-friendly model! If you are looking for something to start out with you can take a look at our PostBase Qi3 Franking Machine Review which could save you even more. Alternatively if you are looking for something with some more features and able to frank faster, take a look here for the PostBase Qi6 model from FP.